Discharge Service Pin was awarded to those that served in Korea from 1950 - 1955. On the back of the pin is recorded a number, that number is registered in the name of the Veteran receiving it in DHH Ottawa. 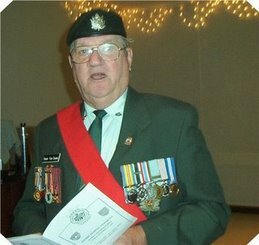 If you are a Korea Veteran there are still a number of active units across Canada. Please consider joining one of the units in your area. 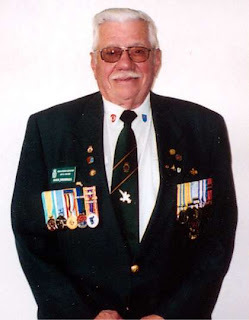 The Korea Veterans Association of Canada (KVA) embodies the spirit of comradeship that was developed during the Korean War and the years that followed. 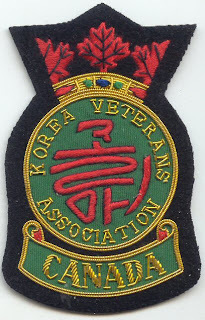 KVA is comprised primarily of members who served in the Canadian Armed Forces (Navy, Army, Air Force) in Korea during the 1950-1953 war and on peacekeeping duties in Korea from 1953 to 1955. 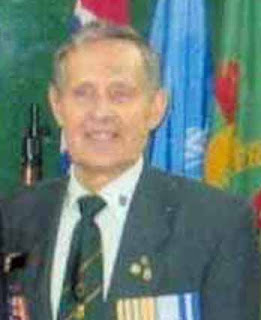 Korea veterans who served with United Nations Forces from other countries as well as certain ancillary units are also eligible for membership (see Membership page). At present there are 53 branches (units) across Canada. Each unit elects its own executive and most meet on a monthly basis except during the summer. KVA is divided geographically into five regions – Atlantic, Quebec, Ontario, Prairie and Pacific. Each region elects its own executive. At the national level the organization is governed by the National Council. National Council is comprised of the National President, National Vice-President, National Immediate Past President, five Regional Presidents, and appointed National committee chairmen. Biennial national reunions (combined with a convention business meeting) are held in even-numbered years. In recent years KVA national reunions have been held in Quebec 2006, Toronto (2004), Edmonton (2002), Ottawa (2000), Winnipeg (1998), Calgary (1996), Ottawa (1994), Victoria (1992) Toronto 1990, Montreal Quebec 1988, Cornwall, Ont 1986 and Ottawa 1984. Most KVA regions meet annually or semi-annually and each unit within the regions hold meetings and social events. Encompassed in the objectives of KVA are the welfare and concerns of Korean War veterans and their families. Representation is frequently made to government departments and other groups either directly or in conjunction with The Royal Canadian Legion or the National Council of Veterans Associations, to protect the interests of our members. 3(d)(i) Any member who causes discredit or dishonour to the Association will be liable to be struck from the membership role of the Association and forfeit all rights as a member of the Korea Veterans Association of Canada, (Inc.). Membership may be revoked by the National Council subject to appeal at the next National Convention General Meeting of the members. (ii) This section includes but may not be confined to the following: Any member who physically or verbally assaults another member, or is found willfully passing on false information in an attempt to tarnish the reputation may be liable to dismissal or suspension for a period of time to be determined by the National Council subject to appeal at the next National Convention General Meeting of the members. Any member who corresponds with the Government or Media in an attempt to negate the results of a majority vote and/or petition relating to Association business will be liable to dismissal or suspension for a time to be determined by the National Council, subject to appeal at the next National Convention General Meeting of the members. 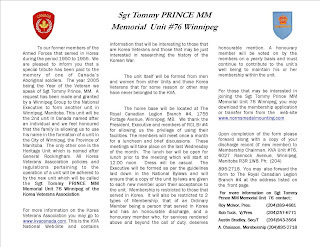 See Unit 76 By - Laws section 18.03 re transfers from one unit to another http://www.normsmedalmounting.com/ Unit 72 presented a resolution at the meeting that reads: THEREFORE: Be it resolved that members in good standing of the Korea Veteran Association of Canada be free to transfer from one KVA Unit to another without impediment, without necessity of further approval. For further information see - History of KVA. Roly Soper over the years has done a job second to none on the National web-site. For information on Korea, special events and things that this organization has accomplished over the years click on the above and enjoy the history lesson. The Heritage Unit was founded by men of vision. In the years ahead when more and more "active" units disband, Korea veterans will turn to the Heritage Unit for information of common interest. The Heritage Unit will help to perpetuate the historical role of Canadians in the Korean War long after KVA as we know it now, ceases to exist. Over 600 Korea veterans have paid the $45 one-time fee for lifetime membership in the Heritage Unit since its inception. The majority are also members of active KVA units. The balance of the membership is comprised of members who belonged to regular KVA units which have now disbanded; members who do not have an active unit in their area and members who do, but who do not wish to participate (such as shut-ins). 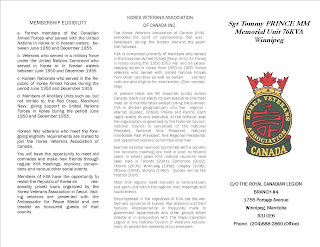 Under ordinary circumstances a member of the Heritage Unit is expected to belong to a regular unit of the Korea Veterans Association of Canada if there is a unit within reasonable commuting distance from the member’s home. 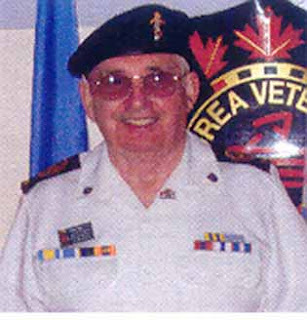 Each member receives a permanent lifetime membership card indicating that he served with United Nations Forces in Korea, an attractive membership certificate suitable for framing and an annual newsletter. Yearly nominal rolls are also published. As mentioned above KVA Canada is divided into 5 Regions, Atlantic Region, Quebec Region, Ontario Region, Prairie Region, and Pacific Region. Each Region has it's own executive and is divided into Units which have their own executive. Both the Regional and the Units conform to the National Rules & Regulations as per the National By-laws. These By-laws are not to be altered or changed without a resolution being put forward to the National Council to be tabled at a National Convention and voted on by the delegates in attendance. Those delegates are selected from the individual Units to act on behalf of the Unit at Regional AGM Meetings and National Conventions. To date they have been held every second year. The Regional AGM is held on the alternate year. At the Unit level, in most cases they meet on a monthly basis to discuss matters of importance to the members and in some cases get together for luncheon and comradeship. Age is becoming a factor in our Units and parades and social events are becoming something of the past. We still attempt to attend functions, carry flags on parade and represent KVA where possible. This may give you the basic working knowledge of the National, Regional and Unit Levels. 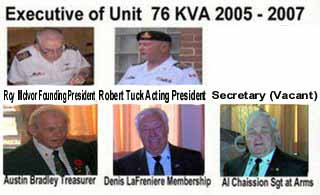 For more information on the different units in each Region see you Unit Presidents or go to - History of KVA. Webmaster Bill Czuboka & Editor Mike Czuboka. USA Presidential Citation awarded to 2 PPCLI for their action and stand at the Battle of Kapyong in Korea on the 21- 23 Apr 1951. It is worn proudly by the 2 Bn PPCLI to this date. The above medals are awarded to those that served in Korea from 1950 to 1955. See honour and awards below for other medals awarded to those that served with distinction during the Korean War. Join with us and support the Royal Canadian Legion and the Korea Veterans Association Unit 76 at # 4 RCL 1755 PortageAve, Winnipeg, Manitoba.